Wolbachia are bacteria that occur widely in insects and, once they do, inhibit certain pathogenic viruses the insects carry. The problem with using Wolbachia broadly to protect humans is that the bacteria do not normally occur in mosquitoes that transmit Zika and dengue. So success in modifying mosquitoes relies on the bacteria's cunning ability to spread like wildfire into mosquito populations. "In this new study, we've dissected a simple set of Wolbachia genes that replicate how Wolbachia change sperm and egg" Bordenstein said. "There are two genes that cause the incompatibility, and one of those same genes rescues the incompatibility. Engineering mosquitoes or Wolbachia for expression of these two genes could enhance or cause the spread of Wolbachia through target mosquito populations." Their achievement is based on inserting genes into the genome of fruit flies. It is described in a paper appearing today in the Proceedings of the National Academy of Sciences, "A single prophage WO gene rescues cytoplasmic incompatibility in Drosophila melanogaster." 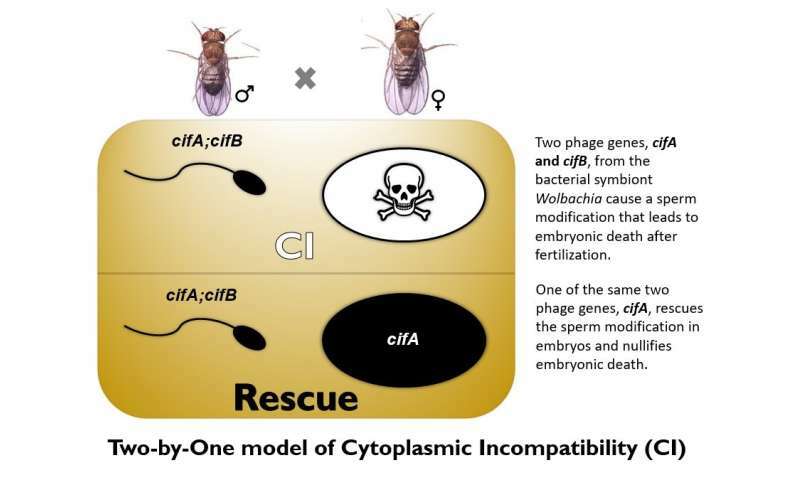 In a previous study last year, the team identified the two genes in Wolbachia—named cytoplasmic incompatibility factors cifA and cifB—and learned that they modify the sperm to kill eggs. Now they solved the other half of the genetic mystery: cifA single-handedly can protect embryos from death. "It's a microbial encryption and de-encryptyion system that ensures Wolbachia spread through insect populations so they can adequately block the transmission of viruses and ultimately save lives" Bordenstein said.